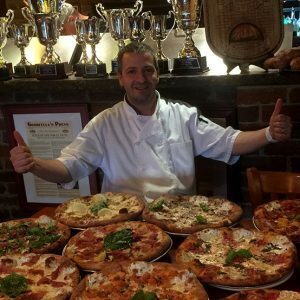 The Baker Raffaele Esposito, who worked at the Naples pizzeria “Pietro…e basta così,” is generally credited with creating Margherita pizza, now known as the classic Neapolitan-style pizza. In 1780 the pizzeria Pietro…e basta così (which means “Peter …and That’s Enough”- funny name, isn’t it?) was established in Salita S. Anna di Palazzo, in the surroundings of the Royal Palace. This name derived from one of the first owners, Pietro Colicchio, known as Pietro il pizzaiuolo (Peter the Pizzamaker). Pietro Colicchio, having no brothers nor sons, handed over the pizzeria to Enrico Brandi, who in his turn transferred the activity to his daughter Maria Giovanna Brandi, the future wife of Raffaele Esposito. In 1889 King Umberto I and Queen Margherita of Savoy visited Naples and Esposito baked them a pizza named in honor of the queen whose colors mirrored those of the Italian flag: red (tomatoes), white (mozzarella), and green (basil leaves). The Rest is truly an amazing history and pizza Margherita is now more popular than ever. The Pizza is cooked at 900f, in 90 seconds, only 00 flour (Italian fine milled flour) is used , sea salt, fresh mozzarella, and San Marzano Tomatoes . It has rules “some organizations claim” as they try to preserve the art. But pizza today (throughout Italy and the world) is truly diverse, it has undergone the influence of regions , cultures , time so many miles, and so many hands have taken it to new highs (and even some lows). The evolution continues today and each man tends to make it his own art ( and to me) that’s the true beauty of pizza. We can teach you amazing styles of pizza at the Pizza School of New York. Not only Neapolitan style but the Best “New York Brick Oven” style Pizza as well. True “New York Brick Oven Pizza” is a crunchier and a more diverse pizza. It is considered more favorable than Neapolitan Pizza to daily pizza eaters in America. With fresh mozzarella toppings and “no true rules” just high heat, fresh ingredients, and flavor! But saying the above does not take away from the original art. 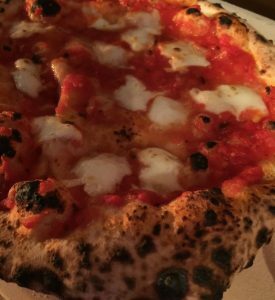 Neapolitan Pizza (rules and style) is now back in vogue and in its pure form is an experience and art that will continue to transcend the decades and all true foodies will praise it .